Kangaderoo Custom QR Code. 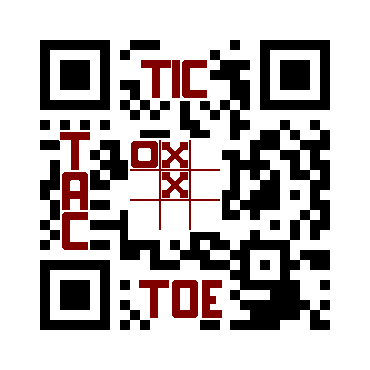 : The QR Code game. Quote from the movie National Treasure: Book of Secrets: "Does not matter whether it is true. -- Give me a list of approved locations." The way QR codes can be enhanced is to use the redundant part of the QR Code, change the information there to by creating a graphic, and recalculate the error correction to keep the code error free. Keeping the error correction intact results in a faster scanning, and more compatible code in relation to various readers. There is another benefit of using this approach. It makes it possible to integrate multiple graphics on multiple locations in one single QR Code. This example shows a tic-tac-toe game in progress, and the word 'tic' 'tac' and 'toe' are also displayed on various locations around the graphic. For more Custom QR Codes and more information, please visit my site.